Noms: ? & ? Have Nots ? Big Brother Spoilers: Sam’s + 1 life Power App will automatically get used this week. 9:50pm Lounge room. Bayleigh and Tyler. Bay – What happened is not towards me. Tyler – its just that sh*t was going on behind our backs. Bay – that’s the main thing.. like who’s lying. Every week is a different week. And still stuck on week one? What?! Tyler – if anything it will just teach us to question things more. Question everything. Bay – and from now on I am voting for myself. Tyler – please do. Bay – and no more voting for people just because someone told me to or because I’m trying to be a good friend. 10:20pm Bathroom. Sam, Rachel and Rockstar. Sam tells them about how she’s making hooch and it should be ready in about a week. Rockstar – he (Brett) can make up stories so I can make up stories that we’re secret lovers. Clearly, obviously right?! He hasn’t talked to me once in this house. We have secret meeting and … I cannot believe that sh*t the first time you talk to me you make up sh*t!?? 9:55pm Bedroom. Fes, Bay and Haleigh. Bay – tells them that Tyler said that he did not swear on his dad. Haleigh – she flipped!? She f**King flipped!? WOW! First of all it doesn’t f**king matter because I am going up this week and I’m probably sitting next to her. Fes – well then I’ve got you. 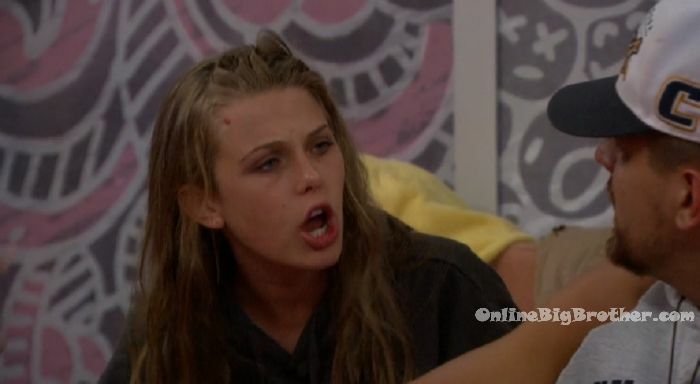 Haleigh – if she puts me up .. even if I’m sitting next to Kaitlyn. I don’t think I would go home. If I am sitting next to someone like JC, then I’m probably gone. Bay – I am here for y’all. Fes – I am trying to figure out who flipped. Bay and Haleigh – we just told you! Fes – okay, then I am on board. First of all Bay, you’re the only one I like in this house. Bay – yeah okay but every time she snaps her fingers, you are right there. Every single time. Fes – my relationship is like you relationship with Brett. 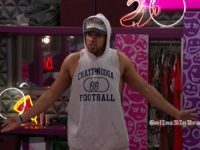 Haleigh – Brett has not lied to my face. Brett has not voted against me and said that he is in an alliance. Brett has not sat and looked me in the face saying this is what he is doing. Bay – I need to know that you’re not going go back to her telling her sh*t. Fes – I just want to know what the f**k is going on in the game. I’m ready to ride. Bay – Sam and Tyler have a final 2. 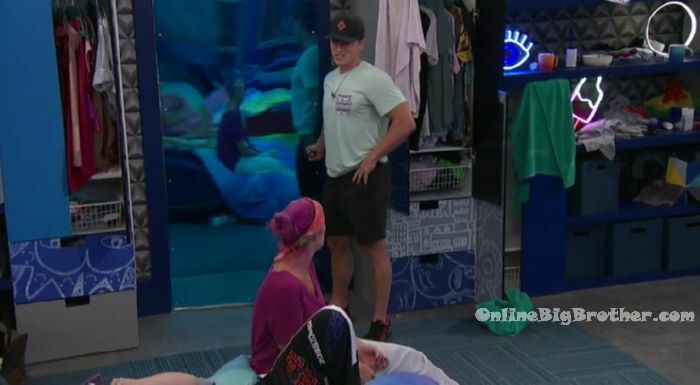 Fes to Haleigh – I would like some love from you everyonce in a while. Do you trust that I’ve got you? Haleigh – yes. Fes – I just need to know who I can trust. 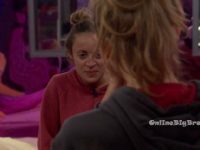 Haleigh – you can’t trust anyone. JC – this is beneficial for you. Fes – one of them is f**King lying to my face. Kaitlyn’s supposed to be my best friend in the house. I am going to look like a dumba$$ if I am hanging out with Haleigh every week and she is sitting there lying to my face. I am going to blow up on somebody bro! JC – you’re not going to blow up on anyone! I told you last week to stay quiet and do this to protect your game. I even tell you who is going on the block. Fes – you don’t know that for sure. She is going to base her opinion off never have I ever game? JC – yes. She already complained about it. She already said that Kaitlyn was treating her bad. But you need to keep your mouth shut. Fes – do you understand where I am at? This is the third week in a row that I have been lied to my face. How the f**k am I supposed to go farther in the game if every week I go hang out with the same people. And the same people are flipping on me? And to my face the same people are going I swear to god it wasn’t me. What the f**K am I supposed to do?! JC – I just told you it wasn’t me. Fes – if you were to tell me right now that you voted to evict Winston, that would make everything so much easier on me because that would mean only one person … now if it was you it would be okay because you’re always up in the air. JC – I told you in the bathroom that you’re trusting these people. Its alright, calm down. Rockstar joins them. JC – it seems like a truck just ran you over. Stop hitting stuff. Calm your t!tties. If I won HOH I could figure it out. I have no power in this game. JC – stop hitting things. It doesn’t look good on tv. Fes – I don’t give a f**K about tv. Rockstar – we just have to stay cool. Fes – our problem is who are we supposed to trust. The fact that I have so many good relationships with y’all and two of you are lying to my face. Rockstar – we’re not going to know until we get out of here. Fes – how the f**k am I supposed to hang out with y’all after the season when y’all are f**king me over in the game? JC – listen they have already made up their mind. Its their game. What was our biggest mistake here? Trusting someone two times. In my book in real life if you f**k me once.. Rockstar – shame on you. JC – f**K me twice.. Rockstar – shame on me. F**K me three times.. JC – f**K me in the a$$.. Rockstar – without any lube. JC – because I deserve it. I think in the second week Brett was in Kaitlyn’s ear and he convinced her to do all the stuff she did. Fes – Haleigh was sitting here cuddling with Brett the other day. How am I supposed to hang out with her after the show. Rockstar – Haleigh hasn’t talked to me all day. ROckstar hugs Fes and leaves the room. Fes – I don’t want to yell at a girl bro. I like Haleigh. Hopefully if she did…. I can’t talk to her outside of here. 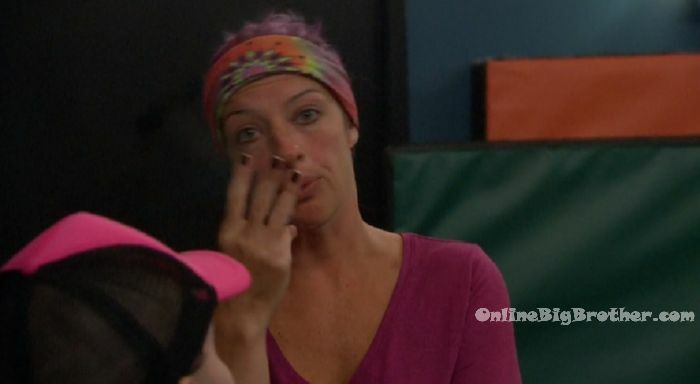 JC – Kaitlyn was throwing Rockstar under the bus with me. She (Rockstar) is not loyal to anyone. Fes – she comes up and starts hugging me saying tell me you love me in front of everyone. She tells me I just cried in the DR… Big Brother blocks the feeds. Fes – f**K them! F**K everybody. 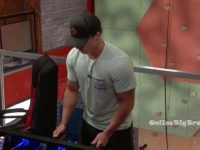 JC – she is going to put up Kaitlyn and Haleigh. Fes – that is going to blow everything up. Fes leaves the room. 11:35pm Storage room. Tyler and JC. JC – and he told me right now that I am the only person he trusts. And then I have the four that are trusting me. Rachel is paranoid and crazy .. she saw me wanting to talk to Sam and she wouldn’t leave because she thought I wanted to talk about her. 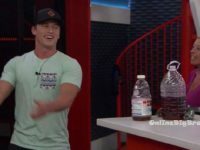 Tyler – maybe Sam will go for Fes this week? JC – no we need Kaitlyn out. Rockstar already hates her. All these people right there can’t stand her. Fes wants her out, I told Fes who the nominees were going to be. Tyler – we are on the right side of the vote every single time! JC – its been so easy! I need to knock on week. Lets just keep doing what we’re doing. I will try to get information. We protect each other. I have Brett in my hands .. he trusts me. 11:37pm Lounge room. Kaitlyn and Fes. Fes – there are two people lying to my face. Kaitlyn – and mine. Fes – why the f**k are you hanging out in the havenot room. Kaitlyn – I’m sorry.. Fes – why are you sorry?! Kaitlyn – the fact the Rockstar is running to him. Why would I hang out with “my friends”? First of all the only people I trust are you and Tyler. Fes – I don’t trust nobody! Kaitlyn – you don’t trust me? Fes – you have lied to me so many times. 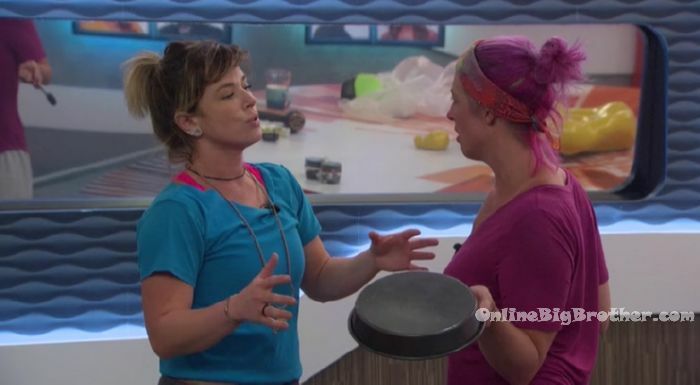 Kaitlyn – I have never lied to your face! And that fact that you could think that makes me so upset!! I have said in the diary room that I am playing for you. Kaitlyn is crying. Kaitlyn – I am so f**king done with you. I have never lied to you. Fes – this is just so stupid. I don’t even want to play this game. Kaitlyn – my heart is broken. If you think its me, then leave! If you don’t want to believe me, then I don’t f**king care. Fes – you need to stop crying. Kaitlyn – if you think I am lying then go f**k yourself. You’re such an a$$hole. Fes leaves. Fes returns and says stop crying. Convince me it wasn’t you. They hear Sam get her HOH key. Fes – come one lets go! Kaitlyn lets go! Come on!! 11:45pm – 12pmSam come out of the HOH room. Who wants to see my HOH room!?? They all head up to the HOH room. 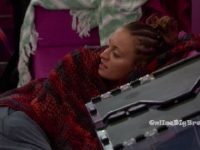 Sam reads her HOH letter. 12am Bedroom – Kaitlyn, Fes and Rockstar. Rockstar – I have never talked to him (Brett), so tell me details. Kaitlyn – just that it was a quick conversation in passing and that everything else that he said to the group. That’s what he is saying. We are all sticking by your truth. And if you’re right then America sees it. I am actually getting to the point where I voted to evict Brett and America sees it. Kaitlyn gets mad that Fes keeps walking away. Fes – what else is there to say?! Rockstar – Brett has his truth and its a lie. Kaitlyn – I believe you. Rockstar – I am so livid at this f**king kid. I hope his mom is proud of him!? He is a white privileged a$$ f**king a$$hole. For calling me a .. I am just trying to get a down payment on a house. Like F**K this DUDE! F**K HIM! 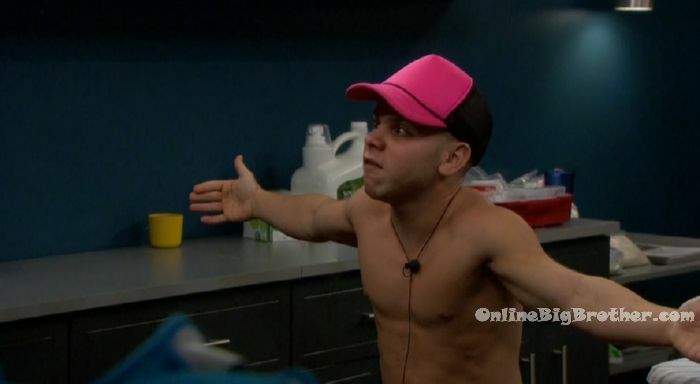 And I hope he does get HOH and I can say f**K you while I’m sitting up there. He is a d**k! He’s been a d**k. His own people have come up to me saying they’re sorry for what he did. Why is he targeting me?!?! Because I’m a severe competition beast? Because what?!!? Kaitlyn – I have no idea. Rockstar – he can s**k my d**k! I thought I could come here and play a clean game. This is not working out. I’ve tried to be loyal to people. He looked me in the eyes and said just own it! Just own it! I’m disgusted!!! I am f**king disgusted. The fact that he is winning .. this caricature of an 80s bully. Is disgusting. The fact that people are surrounding him .. is disgusting. I’m over it big brother, take me out! I’m done! Kaitlyn – enough! Enough of the pity party! Because you’re trying to play for a down payment and he is not. You’re not going to let that 80’s bully win are you!?! Because you sure as hell shouldn’t. You’re letting him win. Rockstar – f**king d**k headed a$$hole that hasn’t acknowledged me since I walked in this house. F**K HIM! F**K HIM! Katilyn – I trust you guys. IF it was JC and Tyler. Like if we’re all looking at each other and swearing.. Fes said he doesn’t believe me. Haleigh joins them. Kaitlyn – are we just supposed to forget how Sam reacted when she walked out of the room. 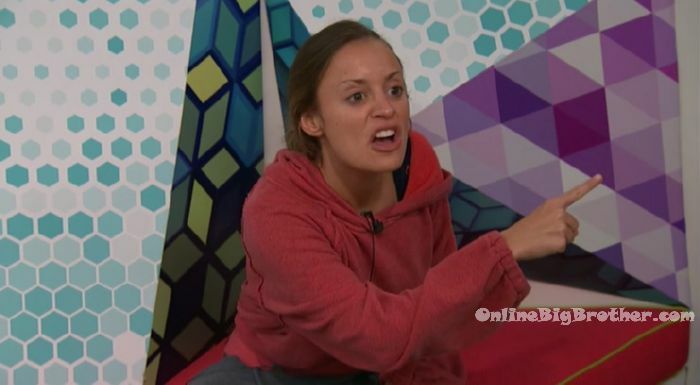 Haleigh – what if that’s what she did, she flipped two votes. One of them was yours and Brett knew that because he was sure you would vote to evict him. Kaitlyn – oh my god, oh my god, oh my god, oh my god!!! NOOOOOOOO.. that is UN… I think you just figured it out. If I am wrong .. my spirits guides have me turned to her … OH MY GOD if that is it I will sh*t bricks. OOHHHHHHHHH GOD! OKAY! Scottie and I looked at her and she said its okay. I was like am I going home. She said you’re not going home. 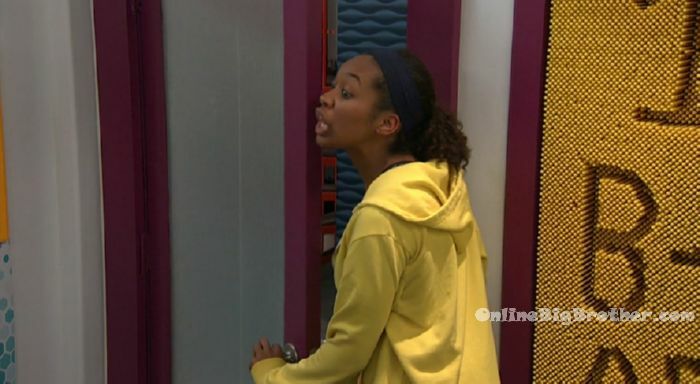 And she got called into that diary room at like 5 minutes to five thirty. And she had to make a decision if she was using it! And she was the last one to get called in. I am DYING!!! None of us went against each other! Haleigh – its a possibility. 12:33am Fes and Rockstar. Rockstar tells Fes about the possibility of Sam using her power to flip two votes. Fes – who’s idea was that? Rockstar it was both of their ideas at the same time. 12:40am Havenot room. Tyler and Angela. Tyler – they convinced Kaitlyn that Sam used a power to flip to votes. And she believed it right away. Its good for JC and I because it takes the pressure off. She wants to believe that more because its easier. 12:43pm Bedroom. Rockstart to Brett – I am so glad that I kept you here. So awesome! Brett – everyone sees now. Its great. Brett goes into the havenot room. Rockstar – f**king di*k. Rachel – don’t let him get to you. 12:50am Lounge room. JC, Haleigh, Katilyn and Bayleigh. Kailtyn tells her about her theory of the Sam using her power to flip two votes. Kaitlyn – all I am thinking about is the 7 people that voted to evict Brett but only 5 did. I am so sick of people not owning up to it. A power was used because I believe every single person. JC – I am trying to play an honest game. Kaitlyn – I don’t really care if anyone believes me because I know I didn’t and America knows I didn’t. I really don’t care. I am someone who steps my truth. I am certified life coach and meditation instructor, I have a family, a boyfriend and a f**King business. I don’t care what anyone things. I voted to evict Brett. I am choosing to believe all of you. Bay – why do you get so defensive when someone questions you? You didn’t need to get sassy with me. I am tired of the drama. Why do you need to drag me into it? Kaitlyn – I asked everyone. Bay – I don’t like how you deliver things. I don’t like how you push when I don’t want to be pushed. Kaitlyn – sorry. Bay – okay and that wasn’t even sincere. Bay gets up to leave. Bay – dont go around bullying me. Bay leaves. Kaitlyn – what was that?! 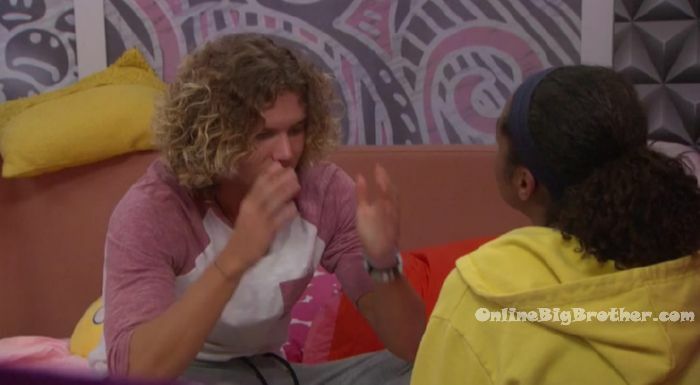 12:55am Bay goes and tells Tyler about the conversation she just had with Kaitlyn. Bay – I am over it! I already know she is going to flip everyone against me. Bay – I really feel like she is bullying me. You think you can talk to me like that. Who do you think you are?! If she keeps pushing me I am going to have a melt down. No one can touch her because your protecting her. Tyler – I see it. Don’t let her get to you. I will never tell her about this. Trust me. JC joins them. 1:05am Tyler talks to Kaitlyn. She tells him about how Bay called her a bully. Tyler – its been a stressful day. Just check out for the day. She is just stressed from the day. Its fine everything is good. They pinky swear. Tyler leaves. 1:25am Lounge room. Fes, Rockstar, Bay and Haleigh Haleigh – the only thing that is keeping me sane is that there is a battle back in two weeks. Bay – yes, bring my baby back. Fes – the only reason I am freaking out is because the stories aren’t adding up. Rockstar – I am telling the truth. Brett and I are in a showmance and he has a micro pen!s. 1:38am Kitchen. Rockstar grabs pots and pans and heads to the havenot room. She yells and bangs the pots and pans. Its a celebration!!! MY best friend in the house!! Give me a B! Give me an R! Give me a E! Give me a T! T! He’s my best friend! Don’t talk about his micro pen!s! Its Brett! BRett! BRett! SO happy he’s here! We have a secret showmance. Brett just smiles and claps his hands. Brett – good job! Such a good example. Rockstar jumps on him. Brett get off of me. 1:45am – 1:55am Brett gets up and leaves the room. Rockstar follows him into the kitchen. Brett – you’re doing a great job! Keep it up! Brett heads up to play Foosball with Angela. Rockstar sits in the living room continuing to bang the pan. Rockstar – Brett are you winning?! Brett – yes. Rockstar – YAY!! BRETT!! Brett is my best friend. Brett start banging pans and then says I’ll just run she will never catch me. Brett runs to the bedroom. Fes and Haleigh laugh. Brett – she’s your friend. 1:57am Sam – can you continue doing this till 2am and then call it a night .. and then you can resume in the morning. You can do what you want but this is affecting everyone else. Rockstar – I am just so excited. Sam – lets hug it out. Your body is shaking. Rockstar – I am not having a good day. Sam – you really need to control yourself. I really appreciate you putting off the punishment. Rockstar – theres no punishment. Sam – thank you for putting off the party. Sam heads to bed. Rockstar – you’re a great guy Brett! See you in the morning. wow… this season is by far one of the best! I was just thinking the same thing. This season brought BB back from the dead. If this year had been anything like 2017, that would have locked in BB’s fate….Great season thus far. It is great….because no VETS!!! Oh… If the game going on like this, pretty sure Tyler will win the money, Like no one even expected anything. And i heard rs make song about Brett. I am absolutely positive Sam is our winner. Bet on it. 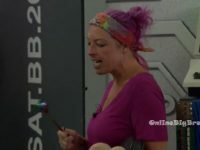 Let’s just role play this: If you’re on BB and in week 1, you’re on the wrong side of the vote, then you know your side is a minority….no matter if from people’s word you count a majority. Then in week 2, again you’re in the minority on a vote, reality is slapping you hard in the face….especially since you knew going in that you were likely on the losing side. So how on earth do you go into week 3 still thinking you’re in power, with a majority, and only now as you enter the close of a full month have you figured out that you can’t dictate who leaves, can’t rely on your alliance, etc? JC is definitely a weasle! If they show it, it’ll probably be everyone learned a lesson and this is a great teaching moment, which it is. I think both Bayleigh and JC grew a bit from that, at least I hope so. Josh was a big immature baby using the pots and pans…Rockpile is a grown woman with children. I mean really?? She disgusts me, sorry. The pots and pans were done and over last season. RS is just too old to act like this and it is not showing her in a positive light. I’ve decided I am now team Rachel. She seems to have a good relationship with everyone in the house. She is funny, sweet, smart, and athletic. Rachel cracks me up. When she breaks into song and dance constantly – she’s keeping Production their toes with “Please – stop -singing.” The fact she has the others convinced she and Angela don’t like each other LOL. Honestly, this season is the best in quite some time. Loving it. What I do love about this season is the fact not everyone votes the same. Although “rockSalt” and Kaitlin are annoying, makes for good feeds. Also, I hope Sam/Tyler really do make a F2 and make it happen. Lmao Brett saying you flipped on your daughters birthday is totally unacceptable but banging pots and pans and screaming about a micropenis is a great way to celebrate for her. RS flipped “out” on her daughters birthday. If I were in the house, I could work around the Bro’s and the showmances. I can respect Scottie for trying take out a stronger player when he had the chance. I could handle Katelyn who is another Vanessa only a lot flakier. I could laugh at Brett provoking Rockstar, It may have been insulting but it reminded me of a move Dan Gheesling would make. What I cannot tolerate is the pots and pans thing. Aren’t we supposed to be dealing with adults here? I likely would have gone off on Josh is season 19. I don’t blame Mark for being angry. Josh wasn’t a great player and only won because Paul had made so many enemies. Simon – one of the great lines last night was Kaitlyn going on with Fes, Bay, Hay and Rocky about who was lying and who wasn’t, “I’m living my truth, I accept your truth (to someone else) and you have your truth (to Rockstar)…”, etc.. something like that, and someone goes, with ultimate sarcasm and cynicism about MKS (More Kaityln Nonsense) “There’s only one truth”. LMFAO. HAHAh i missed that.. so funny.. I also loved “Rockstar – we just have to stay cool.” LOL I think she has kissed that concept goodbye. Did anyone see Tyler the other night competing on that show TKO? He’s really got a good shot at winning this BB season . Besides all the missiles that were launched in the BB house so to speak. Its funny to see certain HG believe there is a battle back for the evicted HG. Nope!! lol at Jc. he is such a weasle. i like how he walks around saying he has everyone in his hands. dumb as rocks to think he is running the house. tyler just listens. haha. that tyler. cant stand his lies but so far he is protected at all angles. Loving Bayleigh right now for stopping Kaitlyn in her tracks. Just telling her like it is. Love it!! I have to say, and it probably won’t be popular, but I have been watching since S1, Ep 1….and lie all you want about your own game, lie about who you voted out or didn’t vote out, make people think you are their #1, speculate about other people & powers they may have….whatever, BUT don’t like about what someone said or did like it is a truth….I don’t appreciate that as good game play at all.